If you have a herniated disc, you’re all too familiar with the neck or back pain that comes with it. You might also be experiencing the radiating pain in your arms, hips, buttocks, or legs. You might be wondering how this all happened, and which treatment options you should consider. Keep reading to get your pressing questions about your painful herniated discs answered. Herniated discs in your neck can cause the above symptoms in your shoulders and arms, while a herniated disc in the lower back can cause these symptoms to show up in your buttocks, thighs, and even your feet. These painful symptoms are also a common cause of sciatica. Over time discs can simply become worn down, a process called disc degeneration. Spinal discs lose some of their water content with age, making them less flexible and more at risk of rupturing, even with a seemingly-minor strain that comes with everyday living. While most patients can’t pinpoint the cause of their herniated disc, others report that it was a powerful sneeze caused a disc to rupture or tear! When the liquid center of the disc spills out into the spinal column through the tear in the outer lining of the disc, painful, life-affecting symptoms can result. When you’re experiencing the effects of a herniated disc, the type of symptoms depends largely on the location and severity of the damaged disc. 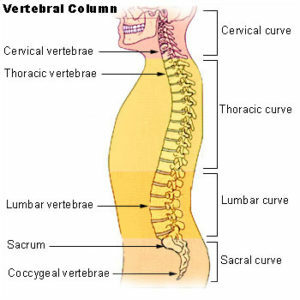 Your spine is made up of three regions: cervical, thoracic and lumbar. The soft-yet-strong discs that provide cushion for each section of your spine make it possible for your spine to support your upper body, maintain a wide range of motion, and support your head all at the same time. Lumbar herniated discs are between any of the vertebrae numbered 1 – 5 in the lower back. This is the most-common type of herniated discs, as it supports so much weight and movement. 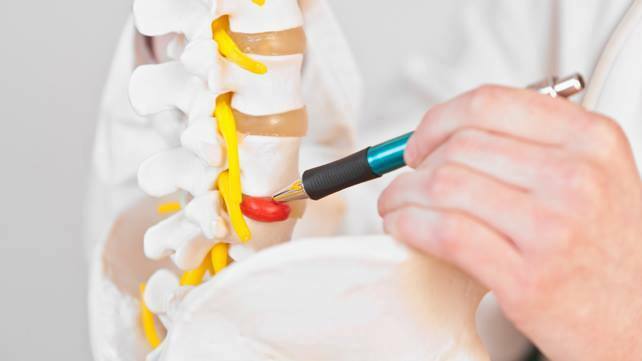 Tingling, numbness, and lower body muscle weakness are all symptoms of a lumbar herniated disc. Cervical herniated discs. These are located between any of the vertebrae numbered 1 – 7 in the neck, and have the complex task of supporting and moving your head. Symptoms here can begin in the neck and travel out to the shoulders, arms, and hands. Shooting pain, numbness, and impaired fine motor skills are also common symptoms of cervical herniated discs. Thoracic herniated discs are found between any of the vertebrae numbered 1 – 12 in the middle back. This type of herniated disc is comparatively rare since vertebrae are attached to the rib cage and don’t move. A traumatic injury such as a car accident is more likely to cause thoracic herniated discs, rather than age alone. Pain symptoms are usually reported in the chest and abdomen. Surgery is also a widely-used treatment option for a herniated disc, including an operation that surgically removes the entire damaged disc. However, surgery carries with it inherent risks, and its long-term effectiveness is becoming more widely questioned. Instead, many patients are turning to chiropractic care and experiencing huge relief. Options include chiropractic care as well as non-surgical spinal decompression tables. Surgery should be a last resort when no other treatments have been effective. Chiropractic care thoroughly assesses your medical history while factoring in the results of a physical exam, orthopaedic, and neurological tests. Everything from your posture to reflexes is thoroughly considered. Chiropractic care is always focused on you as an individual, and your body as a whole. Even if, for example, you only have lower back pain, chiropractic care assesses your entire spine for overall functioning. What happens in one area of your spine can have a huge impact on other parts of your spine and body. A common and powerful chiropractic treatment for a herniated disc is known as the spinal manipulation, or adjustment, which applies gentle pressure to the affected areas. Many patients report experiencing instant pain relief. Then, your ongoing individual treatment plan is customized to your pain levels, activity, overall health, and more. You shouldn’t have to struggle with pain that interferes with your enjoyment of daily life – especially when relief can be simple and long lasting. Make an appointment online or call our team at (949) 397-6699 so our team can collaborate on helping you feel better right away. This article is for informational purposes only and is not a substitute for in-person advice or care from a medical professional. Schedule an appointment online with us for the diagnosis and treatment of your specific condition.